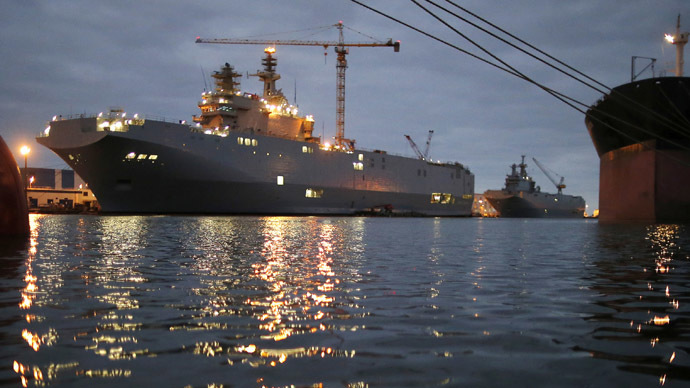 The Mistral helicopters carriers which were supposed to be delivered to Russia are causing the French a headache. However, rather than handing them over, the French government may send them to the bottom of the sea, if the contract is canceled. France was supposed to have received €1.12 billion ($1.25 billion) from Moscow for the sale of two state-of-the-art warships. However, under pressure from the US and EU the sale was postponed, perhaps indefinitely. “Among the possible course of actions which is being considered by the French government is the possibility of the helicopter ships being destroyed. They will be dismantled, remodeled or sunk in the open sea,” the French newspaper wrote, citing an unnamed officer, who is well informed about the current situation surrounding the warships. The reports brought fury from a high-ranking French military official, who told the newspaper that the possibility of the ships being destroyed was “unacceptable” due to the efforts put in by the shipbuilders at Saint-Nazaire, one of France’s biggest shipyards. Le Figaro added that plans to re-equip the ships and adapt them for the French Navy were “unlikely” as they had been specially-designed to coincide with the needs of the Russian Navy. If the vessels were to be re-fitted, the total bill could run into hundreds of millions of euro. "If we cannot deliver the Mistral to Russia, I do not see any reason why we cannot return what they have paid up front," Hollande said, according to Le Figaro. The French publication also added that Paris may have to pay Moscow in the region of €300 million in compensation for a breach of contract. If Paris does not fulfill its end of the bargain, it will have to pay back this sum as well as compensation, which could total €300 million ($330 million), according to French government sources. The decision by the French government is causing concern amongst French business leaders, who believe Paris’ inability to fulfill the contracts could hurt the economy in the long run. The contract to build two Mistral class amphibious ships was signed between Russia and France in 2011. The Vladivostok was launched in 2013 and the second, the Sevastopol, is planned to be finished in 2015. “It would be completely nonsense. We will lose employment for 1,000 workers at Saint-Lazare, which are building these two ships. France will lose money and loose employment, that’s the business part. The second loss is the image. The Mistrals have to be delivered; it has to be mixed with diplomacy. Politics and diplomacy is one thing and business is another thing,” he said.